Disneyland is so much more than rides and food and that’s a big part of why I love the parks. We’ve discovered some unique treasures over the years and I know we have many more to learn. I’ve detailed several, below, so you can share in some of the fun, too! Take a few moments to venture into the Opera House, located at the front of the park. In the lobby, on a large widescreen TV amongst DLR memorabilia, plays a 17 minute movie with Steve Martin narrating how Disneyland came to be. This short film was made in celebration of 50 years of the park, and is a great tool for learning the history and how things came together. 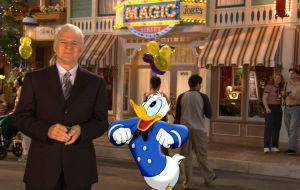 Donald Duck, always in competition, co-hosts and tries to steal the show. I still go in and watch this from time to time because I love it so much. While death certificates used to be handed out at the Haunted Mansion (no longer available), maps of the Jungle Cruise are still available. You must ask on your way out and you’ll be handed a map that looks like this. Occasionally they run out. But, as with many of my other suggestions, it can’t hurt to ask. More common than they used to be, Hidden Mickeys are everywhere. The rumored first published sighting was in 1989. WDW’s Eyes and Ears magazine (for cast members) noted several within the parks and news spread quickly. 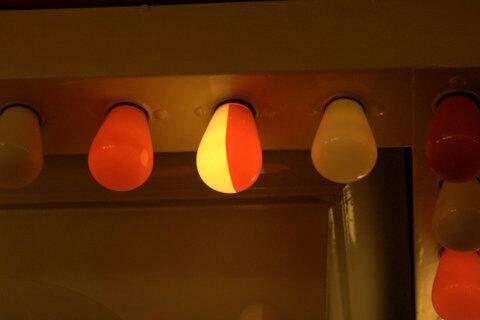 Mickeys of all shapes and sizes can be found subtly worked into the design of rides and other attractions. 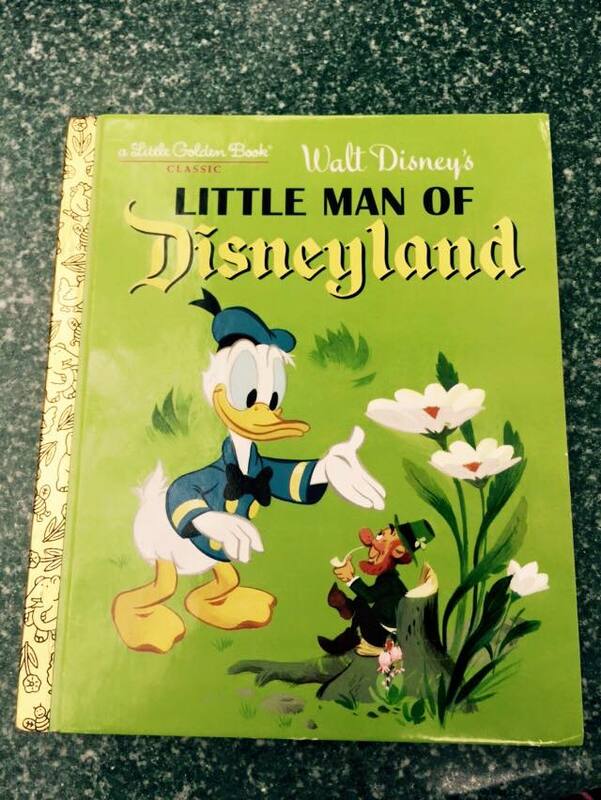 Cast members will sometimes give you hints on how and where to find them, but Disney itself only recognizes them by allowing the book, Disneyland’s Hidden Mickeys, to be sold on site. We love to search for these while at the parks and often in real life, too. In fact, my children pointed out one on the Vatican hymnal at mass recently. Oops. ***This Mickey can be found on Casey Jr. Circus Train in Fantasyland. 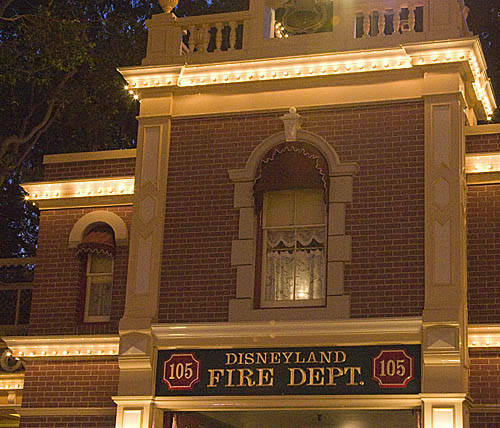 You can locate the apartment easily, as it sits just above the Disneyland Fire Department. A lamp sits in the window, always lit, as a reminder to the great man who built Disneyland. The day Disneyland opened, Walt watched the crowds walk in from the window you can still see today. Young Mouseketeer, Sharon Baird, was there. She says, ““On the opening day of Disneyland, we (Mouseketeers) were in Walt Disney’s private apartment above the Main Street Fire Station when the gates of the park opened for the first time. I was standing next to him at the window, watching the guests come pouring through the gates. Find this apartment and more Disney history by taking my easy, one hour scavenger hunt along Main Street. It’s fun! 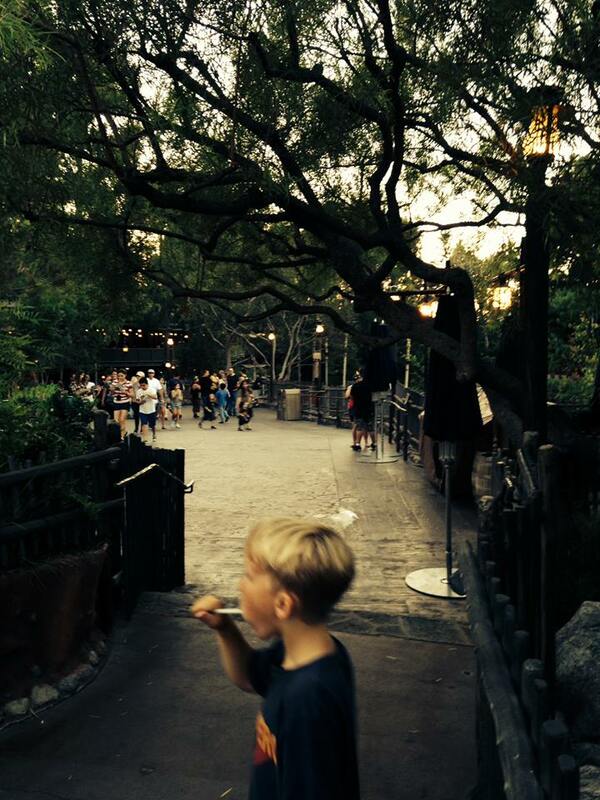 The story goes…….Patrick Begorra lived in the orange orchard that existed prior to Disneyland’s existence. Donald and Mickey came along one day and told Patrick of their plans to build the park. Discussion ensued and a flight to the studios even occurred to show Patrick all that was ahead. After resistance, Patrick finally encouraged the build as long as he could keep a tiny, modest home in the park. They offered him the castle. He declined and kept his home a secret, coming out only at night. Now you can find Patrick’s home and it’s nothing short of adorable. 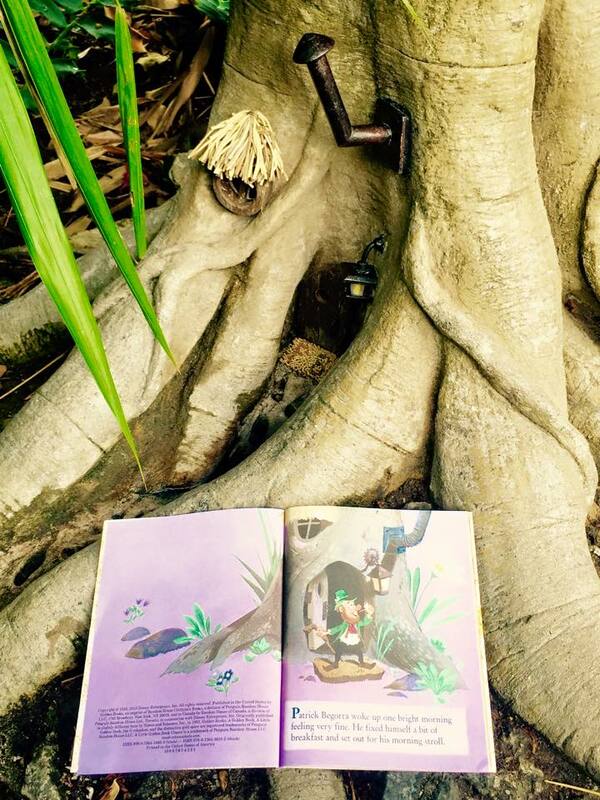 Buy the Little Golden Book from Amazon before your trip, read it, and then find his home during your visit. You’ll have to look a bit, behind those trash cans, but you can spot it if you look into the roots of the trees. Don’t all fictional characters at Disneyland have a personalized door mat? There is a secret path in Critter Country that most tourists don’t know about. 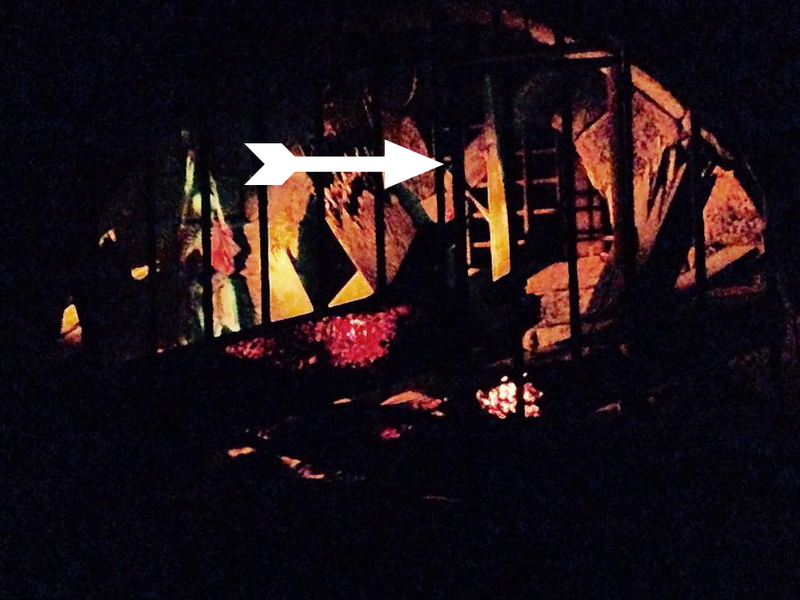 As you’ll see in the pics, it looks like “cast member only” territory. If you walk through it, you’ll find a nice little eating area, a quiet bridge and a good photo op in front of Splash Mountain. If that works for you, take a look at the map I’ve drawn to find it and also a few photos from the actual path. Start at the Harbour Galley Restaurant and head towards the right. 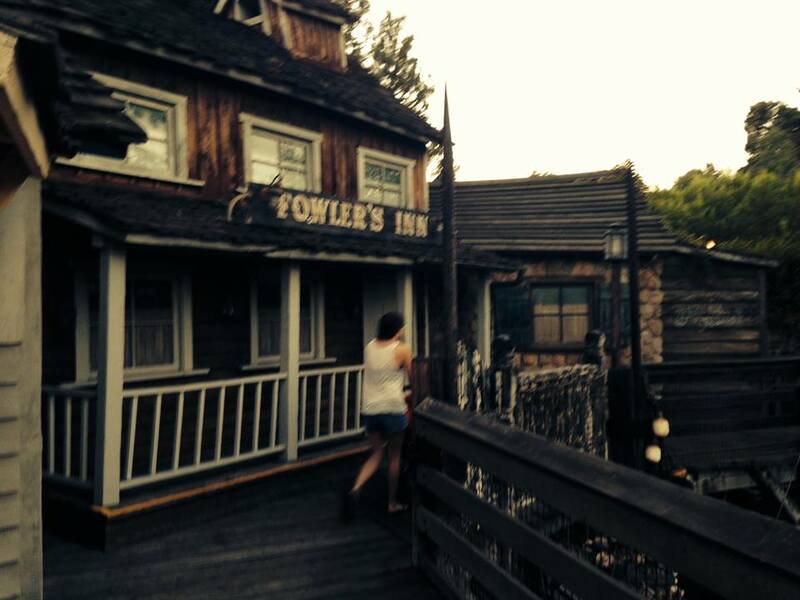 Follow this path to Fowler’s Inn, which is just decor. 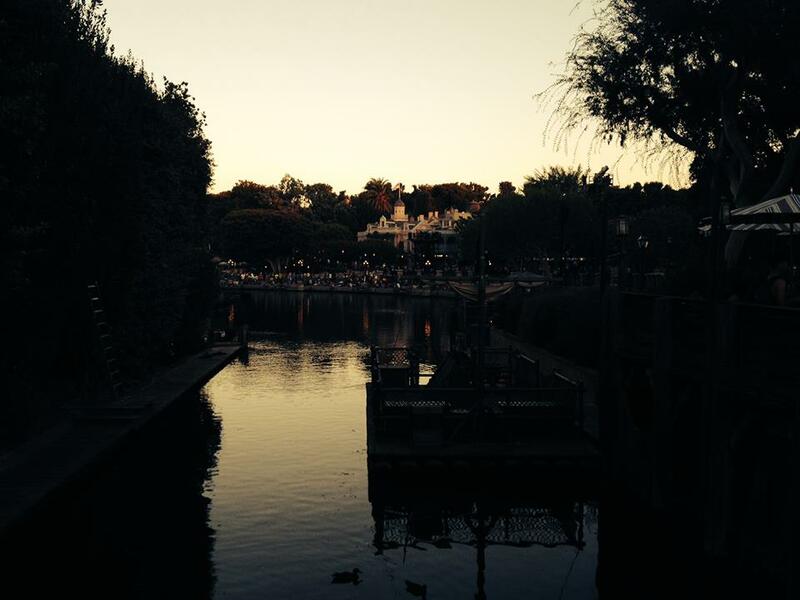 Pause for a view into the Rivers of America. Disneyland seems so quiet from this far back. Stop for a moment if you want to enjoy a picnic or just a place to sit and relax. I LOVE this part of the park at night because it’s rarely crowded. When the Mark Twain is docked next to it, the glow is so pretty. 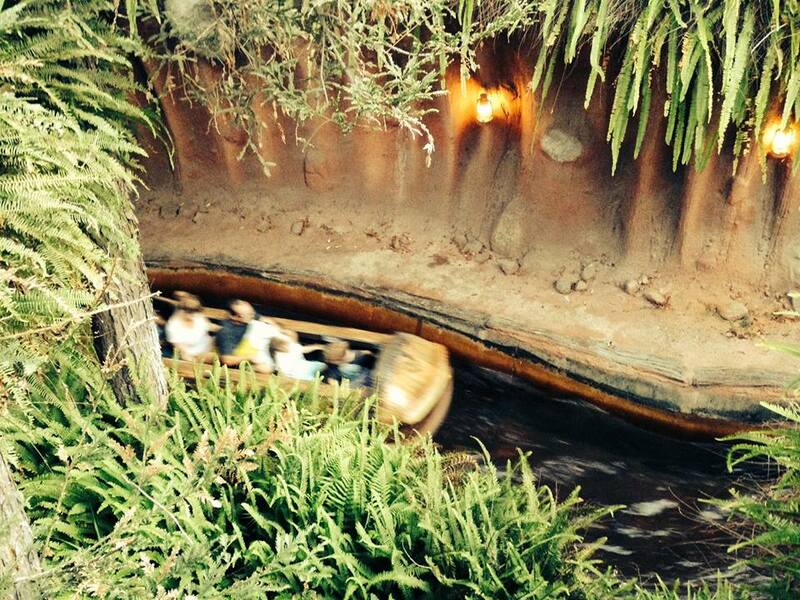 Peek over at people who just flew down the hill at Splash Mountain. They’re always laughing and happy. Makes me happy! Take a photo in front of Splash Mountain. Great shots here! See? So quiet and peaceful. 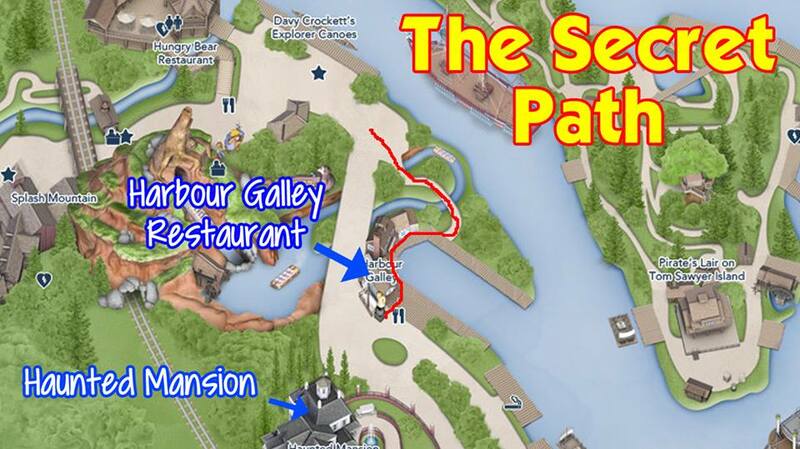 Exit the path here and you’re a bit closer to the entrance of Splash Mountain and the Hungry Bear Restaurant. 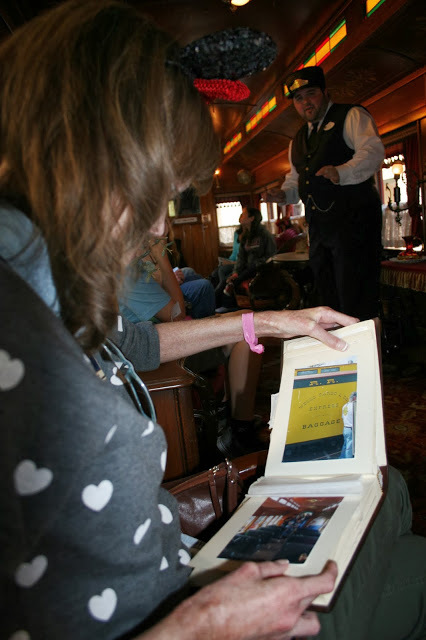 The Lilly Belle is an old Disneyland treasure that used to be open to the public on a very limited basis, but is now only available as part of the Grand Circle Tour. 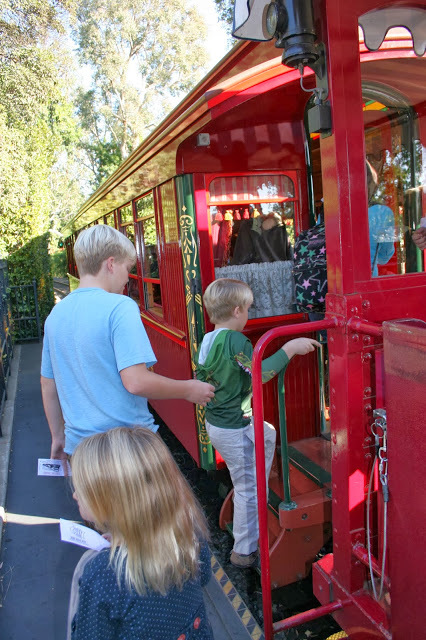 Named after Walt Disney’s wife, the train car was built in 1928 and made with the finest appointments and details at the time. It was and is used to take Disney “royalty”, including Club 33 members, around the park. If you’re lucky enough to go on this tour and ride the Lilly Belle, you’re in for a treat. You’ll take a round trip run through the park and the Cast Member aboard will explain the story of this train car. You will be able to sit down in lovely seats and see things like Walt Disney’s “smoking jacket” and other artifacts. 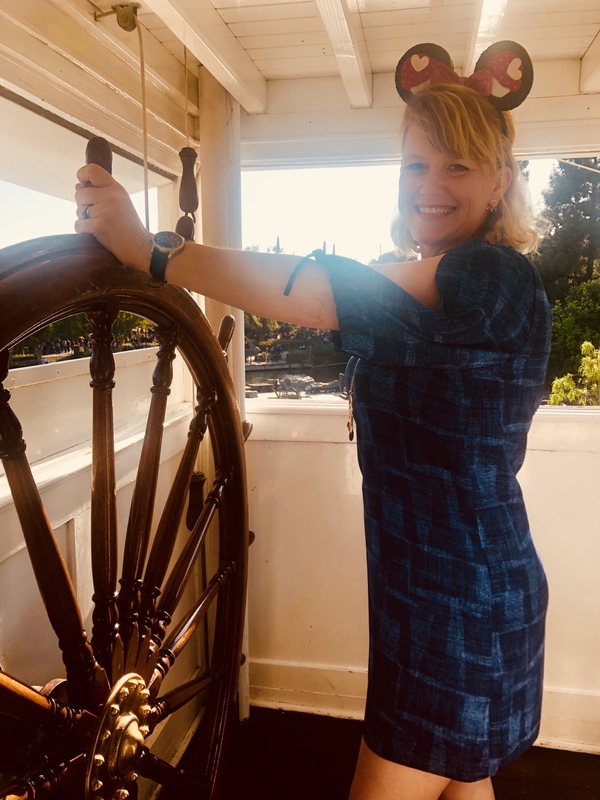 Mark Twain’s Riverboat can be “piloted” on occasion. Not a lot of people know this, but it can happen. Wait until the dock is nearly empty and the boat is filled with guests. Kindly ask a Cast Member if anyone has been selected to pilot the boat. Don’t ask in front of other guests. Avoid putting the Cast Member on the spot. Ask early or late in the day. If the answer is “no”, ask if you can return for another chance and if he or she has a suggestion on what time might be more likely than others. Be sincere and polite with absolutely no inkling of entitlement. This experience is not part of your theme park admission. It’s unique and cast members appreciate seeing how much guests value it. Only four people can do this at a time, so be prepared to ruin someone’s day if there are five in your group. Just kidding. But, know your limits. Ask for a certificate if they’re still handing them out. It’s a fun keepsake! 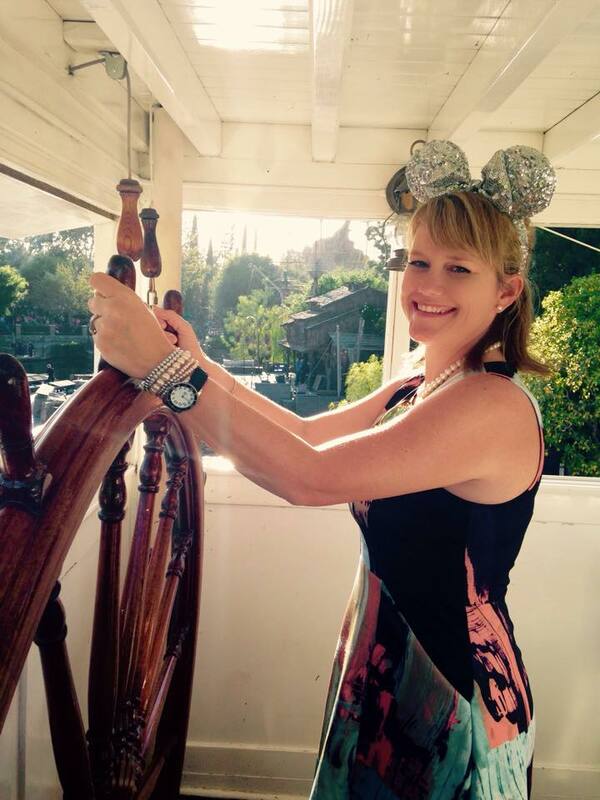 I recently piloted the boat and shared all about it in this post. Typically handed out only for those little ones nervous about the attraction, a glowing wand is kept at the entrance of Ariel’s Undersea Adventure. It lights up during the ride to keep children “safe” from Ursula and the rest of the mean sea critters. Please respect this one and only ask if you truly have a small child that is nervous. After the second major hill, you’ll descend down slowly and take a right turn once the speed increases. 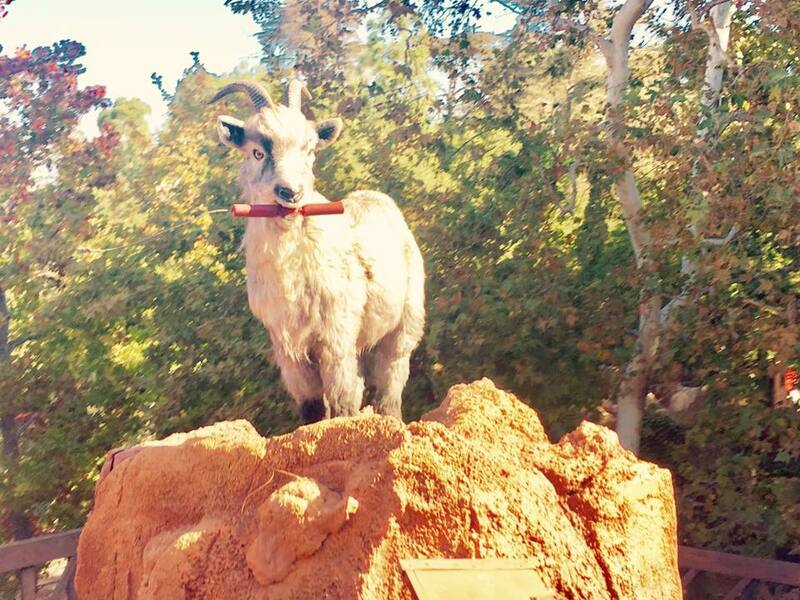 The goat pictured below will be there to greet you. Keep your eyes on the goat as you turn the corner and for as long as you can afterwards, until he’s out of sight. But, for those of you who enjoy this kind of thing, sit as far back in the ride as you can. It’s most effective in the back of the train. This fun event is a bit unpredictable, but when it happens, it’s adorable. Simply put, children gather right after park opening to participate in a “scream contest” to open the ride. Sulley is most often there to see guests during and shortly after the contest. One child is chosen on days when the contest is held. That child will win a certificate for that day that entitles them to unlimited rides on Monster’s Inc. Mike and Sulley to the Rescue! with front of the line access every time. Check out this cutie who won recently. The Citizens of Buena Vista Street (Millie and Molly, Fifi the Photographer, Donna the Dog Lady and Officer Blue) are becoming more and more popular. I ADORE each of them. 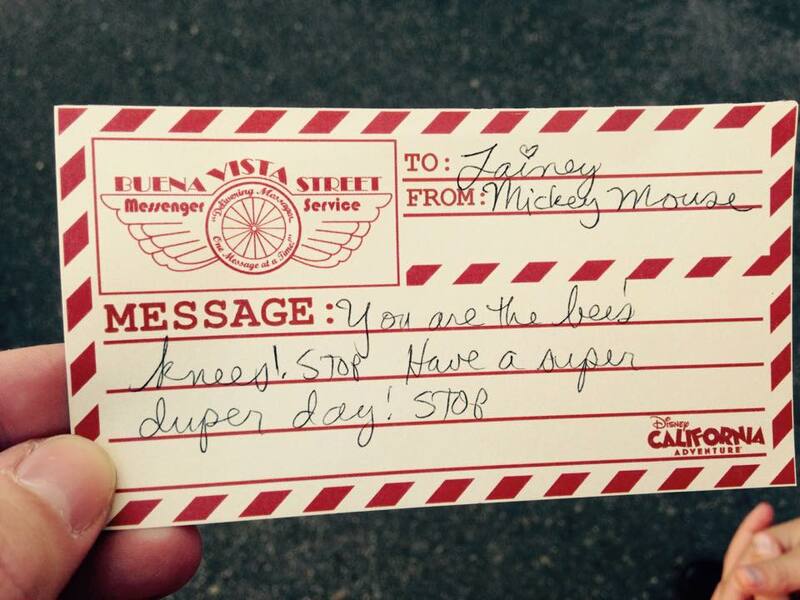 Millie and Molly are bike messengers and can be found handing out messages from Mickey and friends. If you see one of these lovely ladies, stop, say hello and ask if they have a message for you. They’ll take it from there. 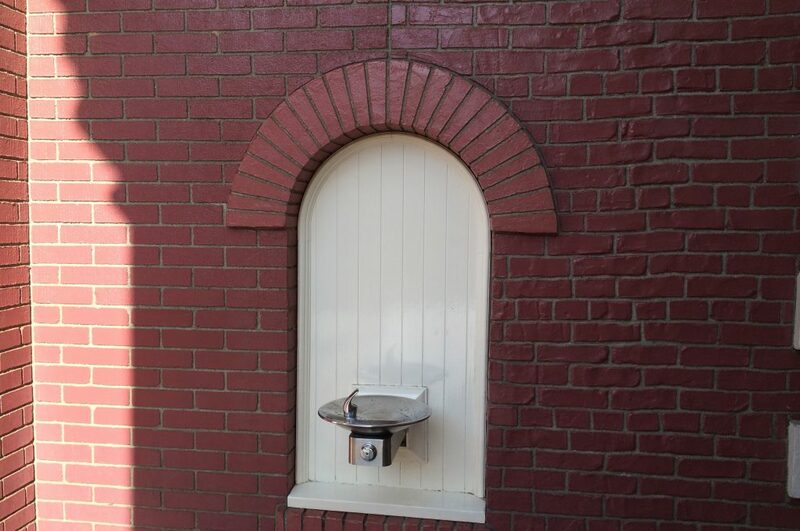 Brick Wall Samples – The “test brick wall” can be found just off of Main Street. You can see brick that was laid out to test, along with different masonry patterns, awaiting Walt Disney’s approval and choice for the park. As you travel on Main toward the castle, go right on Center Street (where the fruit carts are) and head back toward the lockers. You’ll see it surrounding the water fountain. Red and White Light Bulb – At the Coca Cola Refreshment Center (on Main Street), look up closely at the red and white bulbs that adorn the entrance. As they were being installed, the red and white came to an end and a choice had to be made….red or white?! In trademark Disney fashion, no choice was made and instead, a single bulb was painted red and white so that the pattern was never broken. 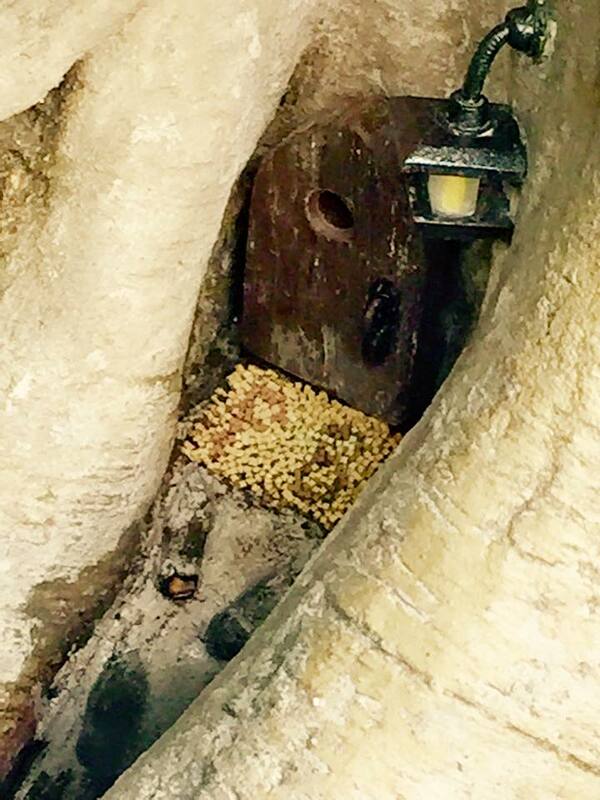 It’s little things like this that make Disneyland unique! 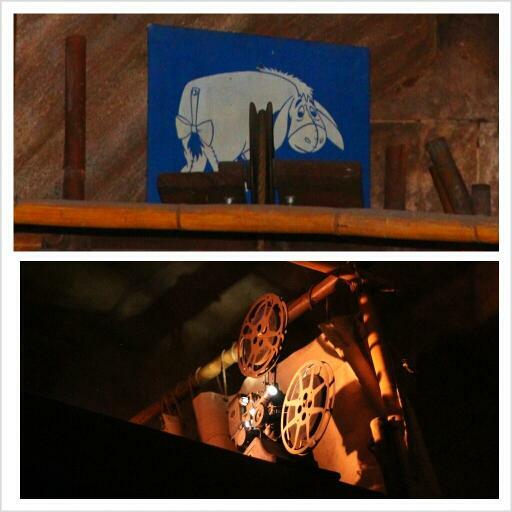 Eeyore sign in the Indiana Jones queue – Since Indiana Jones was built on the Eeyore Parking Lot, Disney pays tribute to him with a sign left over. As you enter the film room, look back and you can barely see it. Ask a cast member if he or she has a flash light to shine on it for you. 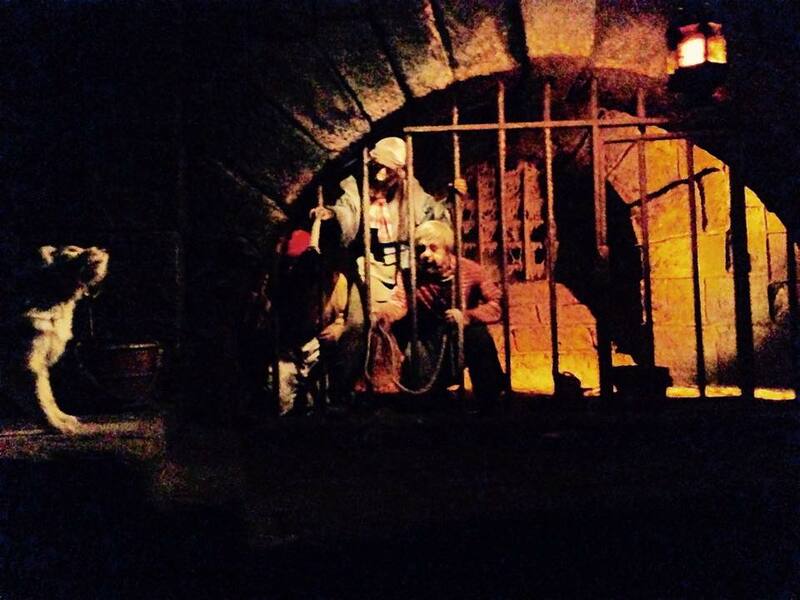 Confusion in Pirates of the Caribbean – Near the end of this attraction, notice the dog holding the keys to open the jail cell holding three pirates. This seems like their only hope for escape. Then, look all the way to your right…..rather quickly…..and notice that the jail cell is actually open for them to walk out at any time. See the arrow in the second photo. It’s hard to tell, but the door has been pushed open with the debris. 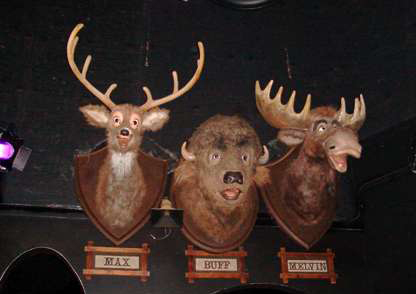 Nod to Country Bear Jamboree in The Many Adventures of Winnie the Pooh – In true Disney fashion, and much like the Eeyore nod in Indiana Jones, you can see the trophy heads from the Country Bear Jamboree in the Winnie the Pooh attraction. After you pass through the dream sequence, look up and back to find these guys. Check out the photos. Keep it weird, Disney. We love this kind of stuff. Want more to do? 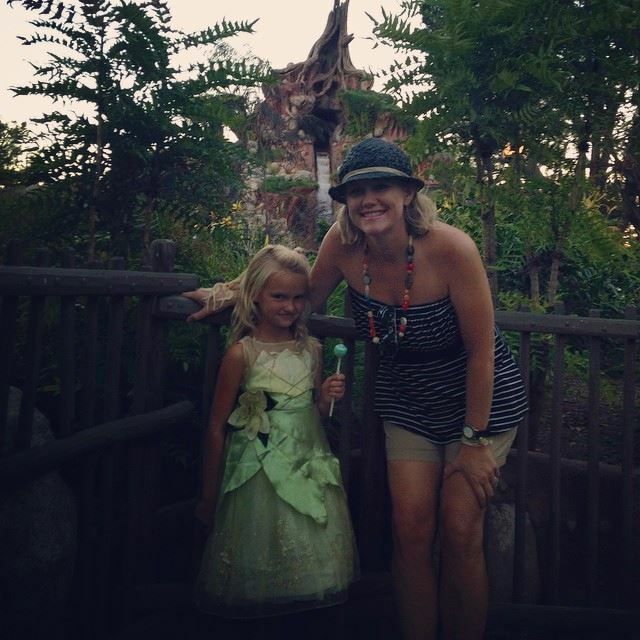 Check out my Totally Free at Disneyland post. There are a few overlaps from this one, but new options, too. Want to test your skills? Follow my Disneyland Scavenger Hunt to find Walt-related stops on Main Street. The hunt takes about an hour and will show 10 significant stops on Main. Yay, this is a wonderful article! I actually made a 1960s Disneyland replica brochure filled with fun facts like this! My son asked for the Death Certificate, and the man at the door was extremely rude to him. My son came back in tears. This is the only time EVER that something bad has happened to us at Disneyland. We wanted to talk to someone about it, but didn’t know what to do. Everything else was wonderful. The cast members were incredibly nice, and the place is spotless! 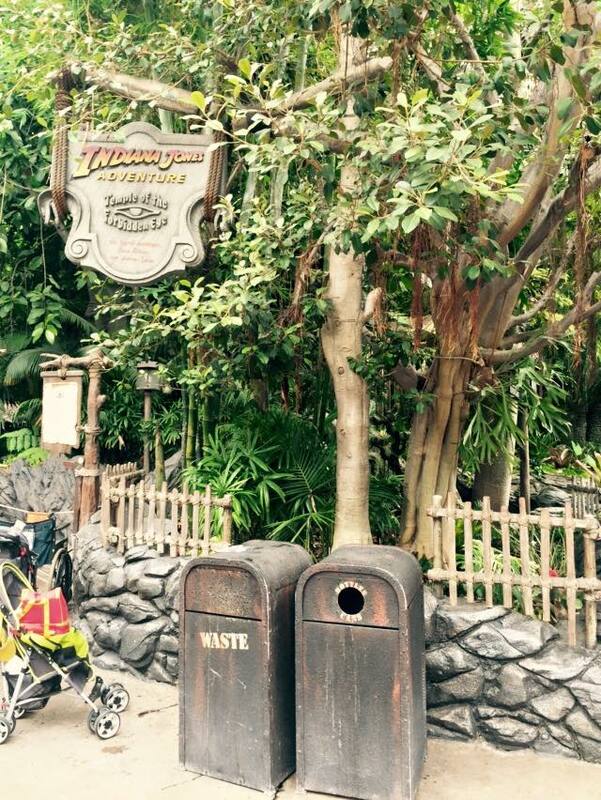 Disneyland has to be one of the cleanest places on Earth! On the same trip, my boy lost his cell phone. We didn’t know until we returned home (Yakima, WA), so I called the Disneyland main phone number. They transferred to their lost and found department. They told us that on an average day, between the two parks and large outdoor plaza, they find around 200 cell phones every day! The lady I talked to took a description and some other information, and two weeks later it arrived home! It was sent by two-day express mail, which was very nice. Great article. The only thing to point out is that the crest on the castle is actually the crest for England with the three lions that represent courage because that is where Aurora is from. The Disney family crest has three fleur-de-lis in the middle of it that represents purity. The Castle Heraldry Shoppe inside the castle only 30 feet away, which was in Disneyland from 1994-2017, had a printout of the Disney family crest on display. I asked them about the inconsistency between the story and the real crest and he said that it is a Disney myth that just keeps getting shared year after year, even by Disney itself, much like the myth of the petrified tree and that it was a gift for Lillian, which was a story Walt came up with. I started researching Disney history in 2006 and have had two books published about it. My most recent book is 700 pages containing over 3,700 fun facts and trivia about Disneyland and Disney Movies. I am always hard-pressed to find new information I don’t already know. From you I learned about the wand on Ariel’s Undersea Adventure and about the telegrams in California Adventure 🙂 Thank you for that. Keep on writing. As of last summer, we were told by a CM that they are no longer allowed to point out the Eyore sign in IJ ? I see this article is posted from 2016…what is still relevant? It’s all relevant. As noted at the top, the last time to was updated was March 2018. Thanks for sharing these! Can’t wait till I come back to my happy place to find them! 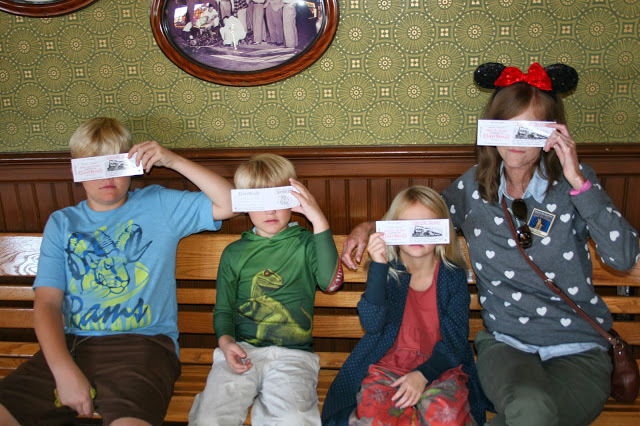 In the past when you got tickets for the Lily Belle does the whole party have to be present? We are going later this year and are hoping to ride but we will be a family of 8. Thank you for everything you do girl!! Not when I toured it last time, but it could change. I’ll try to see it as soon as it’s available again so I can update everyone. I fortunate enough to catch the Max, Buff and Melvin, on my last trip! At first, I was upset they had taken CBJ out (I hadn’t been in 20 something years) but true to Disney form, I saw those guys hangin’ out in the Heffalump room. Great list of off the map attractions! Glad you found them. Love those weirdos! The secrets and stories of the parks are actually one of my favorite parts of Disneyland. I believe that these items truly set the Disneyland Resort apart from any other theme park in the world, Disney or otherwise. Thank you for sharing photos of all these items Casey! I heard that in California Adventure they give out newspapers in the Buena Vista area. Do they still do that? Also where could I find those? They do! You can find them sometimes in Fiddler, Fifer and Practical Cafe (Starbucks) and also near the big map in Carthay Circle (near the wait times). Cute, free souvenir! Do you ask someone or would they be lying around? The newspapers are in a stand by the map on the wall like a regular newspaper distribution. In Fiddler Fifer, they’re sitting on the counter along the windows. 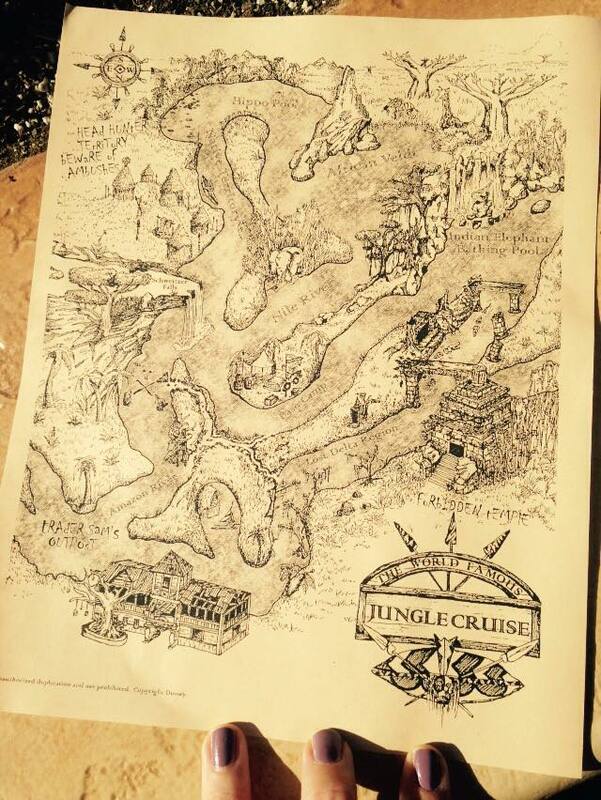 do they still give out the Maps after the Jungle Cruise? When/Where can you find Millie or Molly? My kids would love this so I’m trying to figure this all out! 🙂 sorry for so many questions! 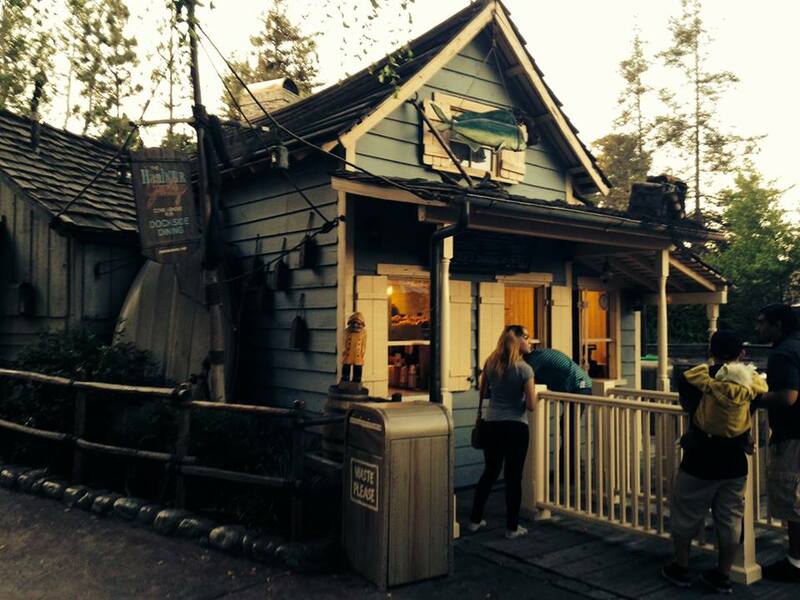 Maps at the Jungle Cruise are still available, but they occasionally run out. 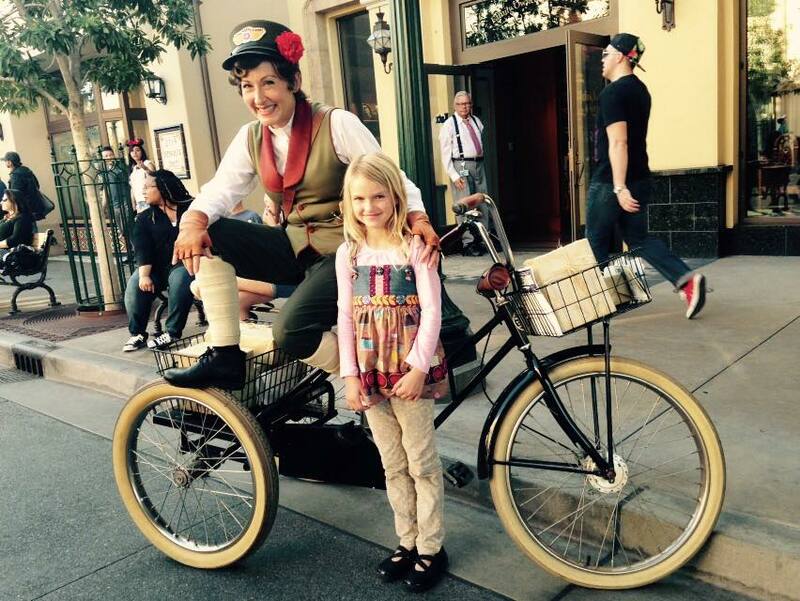 Millie or Mollie can be found on Buena Vista Street wandering around. They don’t have specific locations. 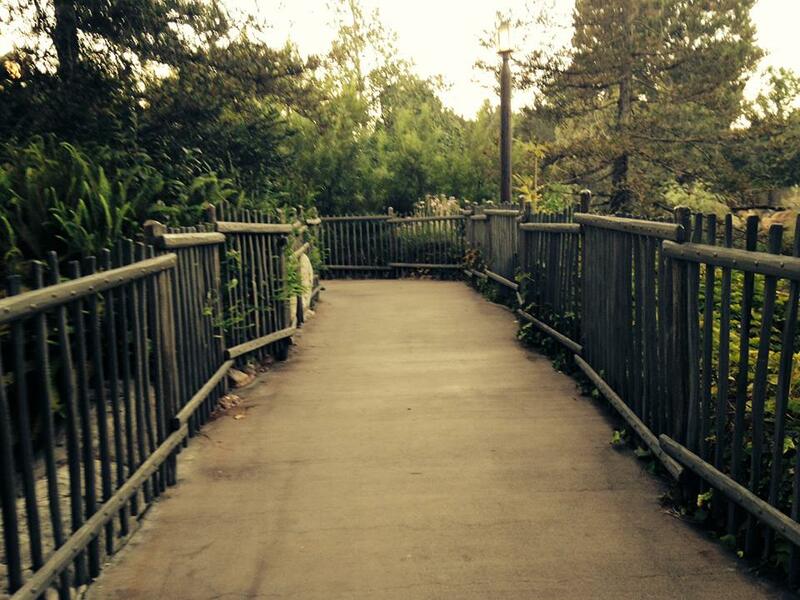 My favorite is the trail along Rivers of America. 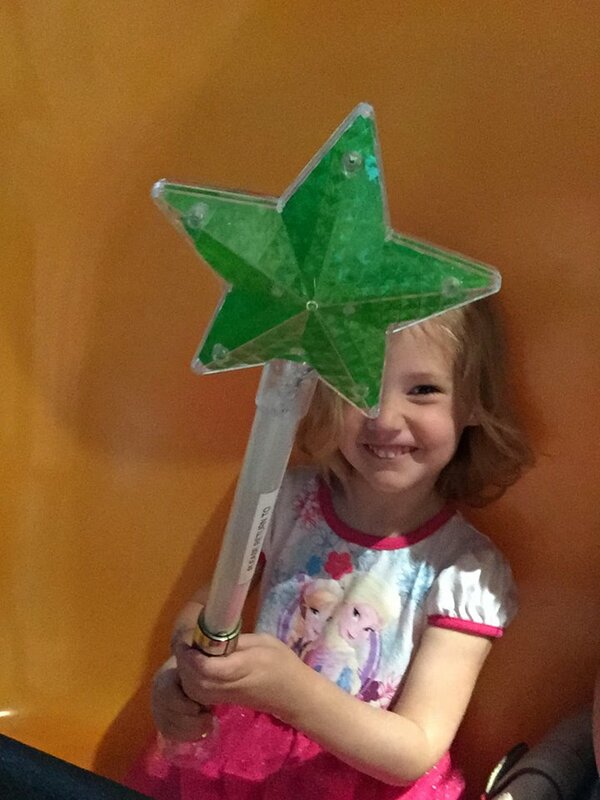 I didn’t know about the Wand on Ariel’s Undersea Adventure…very cool…now I need to kidnap, errr, find a little person to take on the ride so I can take a photo of it…it counts as a Disney Light! It’s not currently in use. Guests tore the box out and it hasn’t been replaced. I’m hoping it is soon. I’ve left messages for lots of people there before. I’ll update this post as I learn more. I’m not sure exactly how it was done but last year when entering Disneyland California on my Birthday I was given a Happy Birthday button by a cast member at the gate. While waiting in line for fast passes (I wish I could remember her name she does the great shows with Goofy the Five and Dime) was riding around on a messenger bike calling my name. I was oblivious to the fact she was calling me personally but was so cute and persistent and actually approached me asking if I was Shannon when I surprisingly answered yes she handed me a hand written birthday message from her and Goofy. I’m 43 years old and felt like a little kid so excited to have such a special gift. Millie or Mollie, the bike messengers. Love them both!!!! They’re in this post, at the bottom. Love all the info in this post! The kids loved that Molly had a message for them from Anna and Elsa! We definitely felt like we had insider info. And Molly was so fun to chat with. You (and 4 friends) can ride in the Monorail’s “nosecone” with the pilot. It’s first come-first serve, so it’s easiest to score these great seats on a quiet day. AND asking at Tomorrowland increases your chances of getting the front seats, since all passengers must disembark in Tomorrowland, but they don’t have to get off at the Downtown Disney station. 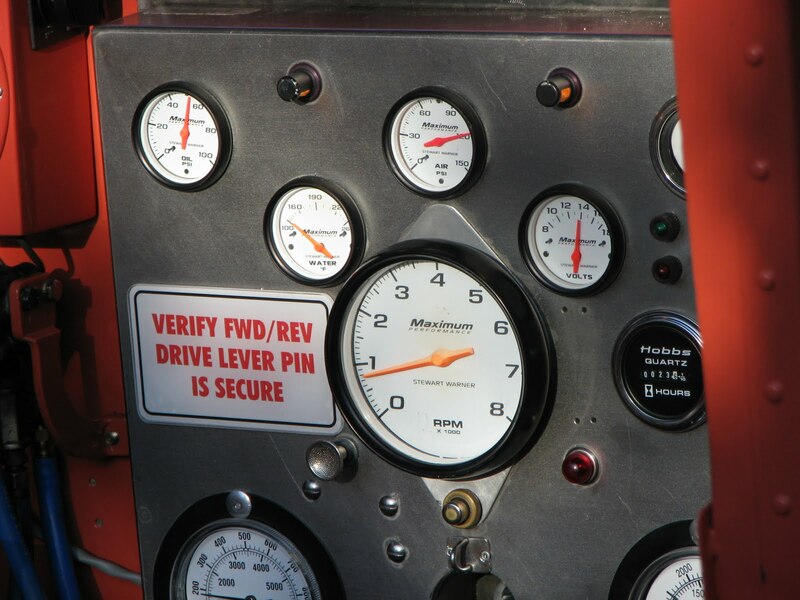 The view during the ride is great from the nosecone and the cast member pilots are friendly. Riding in the Monorail tail (caboose?) is second best. Yay! I love learning new things, too. I love this! There is one to ad. On Indiana Jones where you pass the skeletons on the left there is a skeleton leaning against the wall and he’s wearing Mickey ears. I’m not sure if you can get a picture of it. You have to be pretty quick to see it. I’ve seen it. Never can get a good photo! Love this! Thanks for the map of the hidden path. 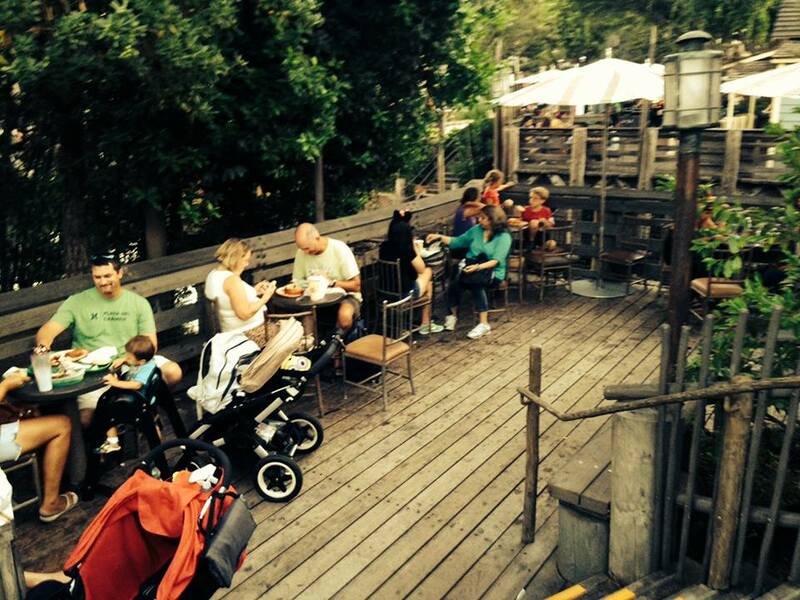 Someone mentioned it on a forum in regards to extra seating at the Harbour Galley and I did not know what they were referring to. We will definitely have to go down that trail on our upcoming trip. I’m looking forward to spending 8 days in Disneyland in September. My first trip to Disneyland was in 1970 with my three children. This year I will be spending my 75th Birthday at Disneyland. 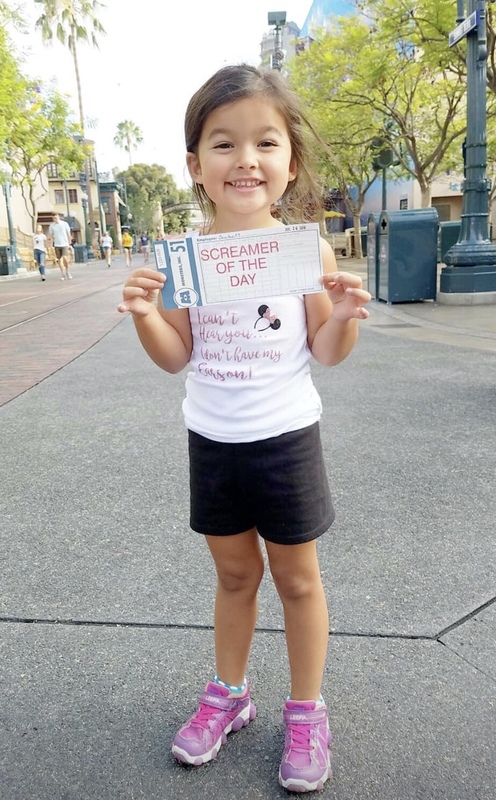 Where else but Disneyland would I want to celebrate this special day. I’m not sure what you mean by moderation. Loved this article, my family and I go to Disneyland about once a week and we are always looking for new and fun things that will keep our trips fresh and exciting. We are going to spend 5 days at the Grand California this summer, I would love to see any other ideas you have for those of us who are Disney veterans. Keep up the good work! I update this post as I find new stuff. Stay tuned and check back often!